The first known interstellar asteroid may hold water from another star system in its interior, according to a study. Discovered on 19 October, the object's speed and trajectory strongly suggested it originated beyond our Solar System. The body showed no signs of "outgassing" as it approached the Sun, strengthening the idea that it held little if any water-ice. The results come as a project to search for life in the cosmos has been using a radio telescope to check for radio signals coming from the strange, elongated object, named 'Oumuamua. Astronomers from the Breakthrough Listen initiative have been looking across four different radio frequency bands for anything that might resemble a signal resulting from alien technology. But their preliminary results have drawn a blank. The latest research - along with a previous academic paper - support a natural origin for the cosmic interloper. Furthermore, they measured the way that 'Oumuamua reflects sunlight and found it similar to icy objects from our own Solar System that are covered with a dry crust. "We've got high signal-to-noise spectra (the 'fingerprint' of light reflected or emitted by the asteroid) both at optical wavelengths and at infrared wavelengths. Putting those together is crucial," Prof Alan Fitzsimmons, from Queen's University Belfast (QUB), one of the authors of the new study in Nature Astronomy. He added: "What we do know is that the spectra don't look like something artificial." Their measurements suggest that millions of years of exposure to cosmic rays have created an insulating, carbon-rich layer on the outside that could have shielded an icy interior from its encounter with the Sun. This process of irradiation has left it with a somewhat reddish hue, similar to objects encountered in the frozen outer reaches of our Solar System. "When it was near the Sun, the surface would have been 300C (600 Kelvin), but half a metre or more beneath the surface, the ice could have remained," Prof Fitzsimmons told BBC News. Previous measurements suggest the object is at least 10 times longer than it is wide. That ratio is more extreme than that of any asteroid or comet ever observed in our Solar System. Uncertainties remain as to its size, but it is thought to be at least 400m long. "We don't know its mass and so it could still be fragile and have a relatively low density," said Prof Fitzsimmons. "That would still be consistent with the rate at which it is spinning - which is about once every seven-and-a-half hours or so. Something with the strength of talcum powder would hold itself together at that speed." He added: "It's entirely consistent with cometary bodies we've studied - with the Rosetta probe, for example - in our own Solar System." Co-author Dr Michele Bannister, also from QUB, commented: "We've discovered that this is a planetesimal with a well-baked crust that looks a lot like the tiniest worlds in the outer regions of our Solar System, has a greyish/red surface and is highly elongated, probably about the size and shape of the Gherkin skyscraper in London. "It's fascinating that the first interstellar object discovered looks so much like a tiny world from our own home system. This suggests that the way our planets and asteroids formed has a lot of kinship to the systems around other stars." A number of ideas have been discussed to explain the unusual shape of 'Oumuamua. These include the possibility that it could be composed of separate objects that joined together, that a collision between two bodies with molten cores ejected rock that then froze in an elongated shape, and that it is a shard of a bigger object destroyed in a supernova. In a paper recently published on the Arxiv pre-print server, Gábor Domokos, from the Budapest University of Technology in Hungary, and colleagues suggest that, over millions of years, collisions between 'Oumuamua and many speeding interstellar dust grains could produce the object's observed shape. Prof Fitzsimmons said this idea was very interesting, and added: "I think what we're looking at here is the initial flurry of scientists running around saying: 'How did it get like this, where's it come from, what's it made of.' It's incredibly exciting. "I think after a few months you will see people focus down on one or two possibilities for all these things. But this just shows you: it's a symptom of what an amazing, interesting object this is... we can't wait for the next one." If planets form around other stars the same way they did in the Solar System, many objects the size of 'Oumuamua should get slung out into space. 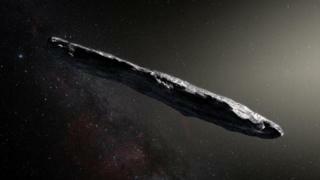 The interstellar visitor may provide the first evidence of that process. "All the data we have at the moment turn out to be consistent with what we might expect from an object ejected by another star," he said. But asked about Breakthrough Listen's initiative, he said: "If I had a radio telescope, I might give it a go."